The Barriere Golf Deauville is the playground of choice for Hollywood golfers visiting this lovely French seaside town known for its popular film festival. All three nines follow gently rolling land that sometimes reveals faraway ocean views. The scenice Le Chateau golf course is a big reason why Terre Blanche, a beautiful five-star resort in the south of France, was recently voted the no. 1 golf resort in continental Europe. Available only to members and resort guests, the Le Riou Course at the 36-hole Terre Blanche Hotel Spa Golf Resort is set on hilly terrain in the south of France and loaded with climbing fairways and elevated greens. Royal Dornoch Golf Club in the Scottish Highlands is perhaps the most impressive confluence of history, beauty and challenge in golf. Its setting along the Dornoch Firth might be the best visual showcase in Scotland, rivaling Turnberry, Castle Stuart and Kingsbarns. Murcar Links Golf Club will finally get its moment in spotlight this summer at the Saltire Energy Paul Lawrie Match Play, a new European Tour event. Originally laid out by Archie Simpson in 1909, followed by a revision by James Braid in the 1930s, Murcar can be murder for those not on their game. Yet it's still an enjoyable walk among the dunes near the shore. Veer a little off course in southwest Ireland and you'll find Dingle Golf Links, the westernmost golf course in Europe and a fantastic addition to any itinerary. Only a handful of golf courses have hosted the European Tour's Irish Open three or more times. Fota Island Resort in County Cork is one of them. The renowned Deerpark Course at the resort hosted the 2014 event to complete the trifecta. The well manicured, 6,921-yard parkland gem attracted a strong field and good crowds. Located in the western Czech Republic, not far from the German border, Royal Golf Club Marianske Lazne received its "Royal" status in 2003 from Queen Elizabeth. But the club's roots date back to 1905 when Kind Edward VII conducted the grand opening, making it the only course in central Europe with such a distinguished past. Stately pine trees are scattered across the varying elevation changes, creating a parkland course that is as scenic as it is challenging. Climbing Gullane Hill into a headwind might be the toughest walk in golf, but the reward of playing the No. 1 Course at Gullane Golf Club is certainly worth the effort. 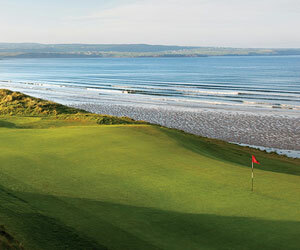 The view from the elevated third tee box reveals links golf at its finest. Holes spill in all directions with the Firth of Forth as a backdrop. There is nothing man-made about Portmarnock Golf Club in County Dublin, Ireland. All of its links features were crafted by nature, which is to say the rolling terrain plays no small role during the round. In addition to providing constant ups and downs, the elevations provide panoramic views that stretch all the way to the Hill of Howth and the Mountains of Mourne.